Apartment description - 5 double-bedroom apartment with 3 full bathrooms. One big en-suite bathroom in master bedroom with two sinks, bathtub, toilet and bidet. Second bathroom with sink, shower, toilet and bidet. Third bathroom with shower, sink, toilet. Please note the third bathroom is small. Complete kitchen including oven, microwave oven and full-size refrigerator. Master bedroom and 2nd bedroom with 140 x 200 cm bed each. Third bedroom with 135x190cm bed. 4th and 5th bedroom have two single beds each (all 80x190cm). For maximum comfort this apartment has air-conditioning machines in 4 of the bedrooms and living room. 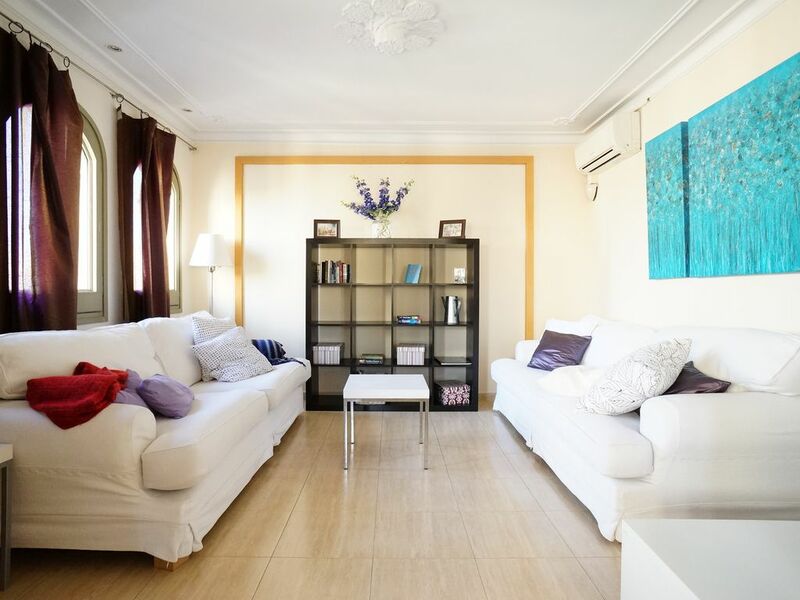 Location - The apartment is in the historical part of the Eixample area, at short distance and midway from the Sagrada Familia temple and Passeig de Gracia shopping. Transportation - Near Verdaguer metro station (on yellow and blue lines) and several bus lines. Very easy to get to by taxi. Management - We are a small family company. Lauren is from Dallas, TX and Fernando is from Barcelona, Spain. We currently run 16 holiday apartments in Barcelona, 2 furnished homes in Dallas and 8 holiday apartments in Istanbul. We apply our same high standards in every country. Noise levels - Façade windows have double glazing, but there can be some street (traffic) noise in three of the bedrooms (the 2nd, 4th and 5th). Occupancy - The apartment is ideally suited for 8 people. It can sleep up to 10. Check-in and check-out - The apartment will be ready for you at 16:00 for occupancy. You can drop your bags and get your keys from 12:00 (noon). Check-out time is 11:30am. You can request reserved early check-in or late check-out for an extra fee, subject to availability. There is no extra fee for nighttime check-in. We have our office in the building next door. Reservations - We conduct reservations by email, that way there is a written record of all communications and much less room for error. We do not take reservations or payments by phone. in the living areas and 4 of the bedrooms. There is only one elevator. We cannot guarantee it to work 100% of the time. The location was perfect to reach all the major sights quickly. There are taxi stands on all four corners which made sightseeing so easy. There are nice little restaurants within walking distance of the apartment. One key factor that made our group of women feel a little uneasy was there wasn’t a secondary lock on the front door. We had a group of people ring the doorbell at 01:00 am, turns out they had the wrong apartment. This highlighted the fact there wasn’t a secondary lock for our protection. Once a secondary lock is added, I would definitely recommend staying here and would love to come back. Beautiful! But needs some repairs. I loved the spaciousness, the beautiful views, comfy beds, lovely sitting rooms and dining room. I never used the kitchen because there was a great cafe downstairs. The location, walking distance from the Sagrada Família, was wonderful. But! They have got to fix some things. The double sinks in the master bath have completely fallen off the wall and been removed! That’s right, the master bath has no sinks, and no counter! Also, the master bath toilet clogged on the second flush and it took two full days for them to fix it. I only got in a couple more flushes before it was time to leave. I highly recommend this place IF you verify they have fixed the master bath, and if you get agreement up front that they will respond immediately to anything as serious as a smelly clogged toilet. The place really is beautiful. Amazing Apartment and great location! I rented this apartment for about a week in November 2018 with 6 friends. It was an amazing time! The apartment is spacious and comfortable with all the modern amenities anyone could ever expect. The customer service was fantastic. The apartment was in a great location where you could get most places by foot or by a cheap taxi. Also the view from the apartment is fantastic! I highly recommend this place if you are staying in Barcelona! Apartment was spacious with lots of bedrooms and bathrooms. It wasn’t super clean which is always disappointing, especially traveling with children who play all over the floors. The place overall was mediocre. Fernando’s apartment was wonderful! Very clean and nicely accommodated our group of 10. Fernando’s apartment was great. In a great location near all attractions but also nicely outside of noisy/action packed downtown. He was flexible enough to accommodate an additional guest we had at the last minute and the apartment nicely fit our group of 10. Apartment has everything one needs for a great stay ranging from appliances to linens provided. Electronic entry facilitated our group being able to smoothly and easily enter the apartment upon arrival and the rooftop terrace was a great bonus with good views. Apparently, any sound does carry in the building quite significantly (and somewhat unexpectedly), so be advised of this during suggested “quiet hours”. Madara was a kind and wonderful host/contact, as well. Overall a great stay in Barcelona! Thank you! 11 of us stayed in this appt for 4 nights in September,from the initial booking to us leaving the communication was first class,they even accommodate another guest as originally there was only 10 of us. The appt itself is clean and very roomy,with lots of bed space,it’s very quiet on a night,and the aircon is great.the living area is also roomy. Madara our greeter was extremely nice,and explained lots things to us,it’s location is very good 2 mins walk to Sagrada de famlia,15 walk to las ramblas. There are many bars and restaurants around the appt,the one directly underneath is very good for a drink before bed after a long day,run by an Italian couple,great hosts & good for local information. We would not hesitate to stay here again!!!! If your thinking of booking this place,don’t think twice, or you’ll miss an opportunity. Thank you for being our guests! It was a great pleasure to host you. We will be very happy to have you again in our apartments! For groups of 5 or more people under 30 y.o. - security/damage deposit 300 EUR, for groups of 8 or more - 500 EUR.